LEICESTER, Sporting Alert – Manchester United fans are starting to become more and more frustrated with the playing style of Louis van Gaal. The Dutchman has turned the Red Devils into a very cautious group — backing away from the familiar exciting flashy and speedy style the club fans have grown accustomed to seeing. In all honesty, it is sad to see what Van Gaal is doing to this Manchester United side, and if he can’t see how much damage he’s causing to the European powerhouses, then maybe he will want to read what the followers have to say. After watching Manchester United struggled to create chances in a dull 0-0 draw in the Champions League in midweek against PSV, the supporters blasted Van Gaal for setting his side up to defend again at Leicester City on Saturday. This week, the former Barcelona boss opted to play with a three-man centre-back against one striker. There is certainly evidence to justify the fans’ frustration, as after spending a huge sum of money in two summer transfer windows, Manchester United have failed to make the top five in goal scored so far this season. Manchester United went into Saturday’s game with the perfect opportunity to deliver a productive performance and move top of the EPL standings. However, as they have been accustomed to doing all season, the visitors, rather than going out for a victory by playing attacking football — made almost 600 ineffective passes for 68.9 percent ball possession in the 1-1 dull draw. And Van should be thanking his goalkeeper David de Gea for making two or three big time saves, which stopped the home side from embarrassing his Man United. The fans are clearly fed up with this new-look Manchester United setup, and are calling for the club’s leaders to make a push for either Pep Guardiola or Carlo Ancelotti, two managers former boss Sir Alex Ferguson had tried to persuade to replace him at Old Trafford after he had decided to retire. 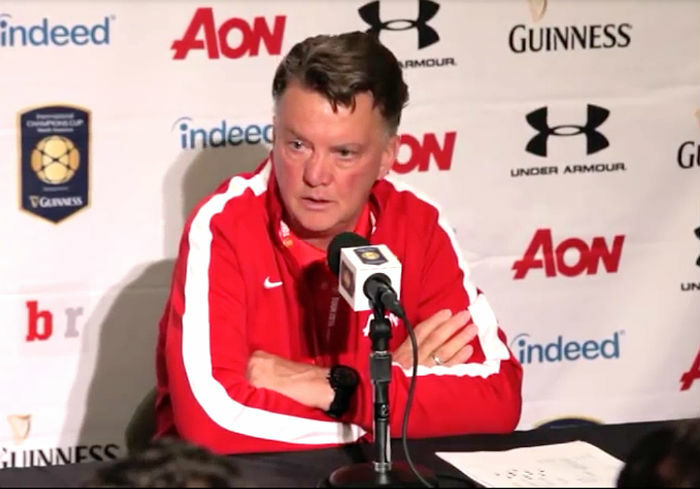 After the game, Van Gaal told Sky Sports that it’s the players who are not creating chances, not his tactics. He said: “In the third or fourth phase we have to create more but it is difficult – you have seen where Leicester are on the pitch, double on the 60-metre area. Sign another 8 defenders n sell all out attackers. Next season 38 cleansheets. Break the record lvg! You d#*k! Buy more defenders. Sell all attackers. Play with 2lb, 2rb, 4fb and 2 defend mid. Mayb we can go 38 cleansheets next seaaon. Go on lvg! Set a record u d#*k! Yr philosophy!